Does anyone have any information about the WW1 rifle range? It is thought that it existed briefly, possibly in connection with musketry training of troops based at Kinmel Park Camp, from about 1915-1918. The camp had capacity to house some 10-20,000 troops and provided training for many recruited in Wales. Below is a poster which allows the range location to be plotted fairly accurately at Foryd, aligned at a right angle to the location of a much earlier range here. Image from Flintshire Records Office. 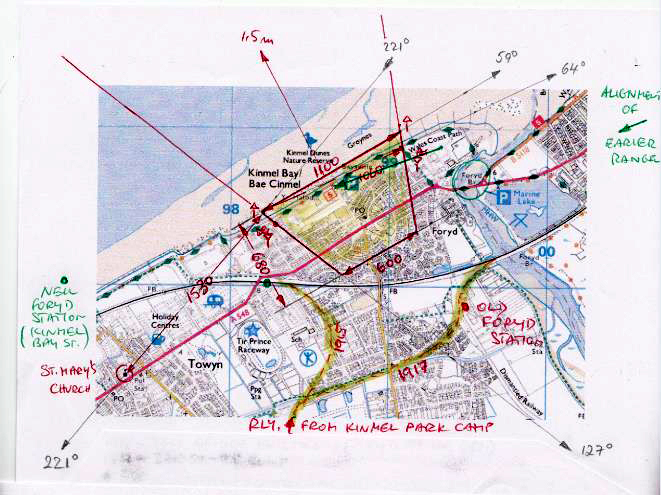 A reader, who is researching the history of rifle ranges in the British Isles has sent in the following information and would welcome any information regarding the Rifle Range at Rhyl. 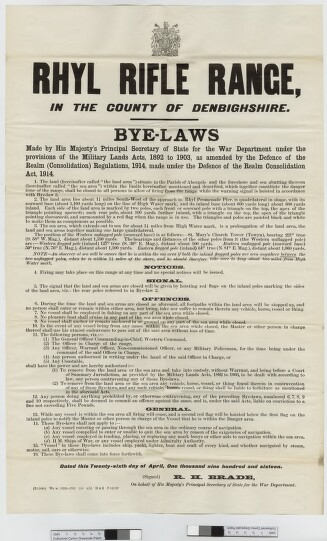 “The Flintshire Record Office holds a poster giving details of the ‘Rhyl Rifle Range Bye-laws’, already being listed on the MoD ‘lapsed bye-laws’ website as a range, for which date and text were no longer available. That was until now, as the poster shows that the bye-law came into force from 26.04.1916 and is likely to have been repealed in 1919. Based on the details given in the bye-law, it is now possible to plot the range on a modern OS map. The max. length of its potential 600 yard firing point is given as 600 yards; this allows for a possible number of up to 144 targets. The range is located across the former target locations of an earlier Victorian range at Foryd, which is shown on the early OS maps. The alignment of the WW1 range is at a right angle to that of the earlier range. It also cut across what is now a major coastal road (A548) and would have led to its closure while firing took place. At that time the Foryd Bridge, just E of the range, was a toll bridge (rebuilt in 1932). Only 500 yards east of the range a railway line from Kinmel Park Camp fed into the main line at the (new) Foryd Station (or Kinmel Bay Station). A website concerned with local railway history gives details of this station having been closed ‘as an economy measure’ from 02.07.1917 until 01.07.1919. I believe that the real reasons for its closure are more likely to have been connected with the close proximity of the range and military activities in the area. This earlier W connection was complemented in 1917 by an E curving connection, feeding at the (old) Foryd Station into the line from Denbigh; thus allowing trains from Kinmel Park Camp direct E access onto the main line towards Point-of-Ayr and Chester. They probably did have a rifle rang there because the Canadian were based there.